Nearly 4 years ago Jon Smirl, the author of the experimental Xegl server wrote a nice summary about the state of linux graphics. He did that after realizing that it take much more time than he could out into Xegl in order to fix the linux graphics, so it is a realistic summary. The interesting thing is that in his vision he described an X server which would run without root privileges and use OpenGL for all its drawings. Number one on his todo list though was a memory manager for DRM, which would enable all the nice stuff. Well it seems that coming with Karmic we will finally see that first step done; most of the users(Intel and AMD) should get a nice in kernel memory manager which will be visible by Kernel Mode Setting. So what can we expect next? 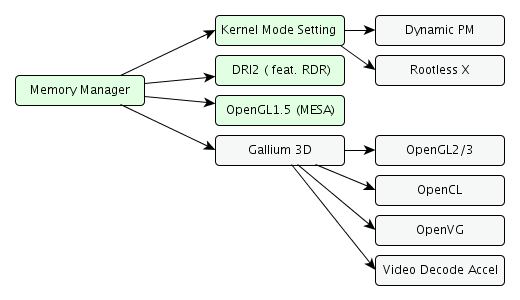 This diagram shows the dependencies of the various features. (Source) Green is what we should get with Karmic. The graphics-memory manager in kernel allows moving mode setting there too, so the resolution is set only once during bootup (flicker-free). Since the graphics card is now controlled from one hand it also allows dynamic power management to be done and does not require root privileges for X, which results in better security. Memory management also allows giving 3D applications their private front buffer, so they dont conflict when rendering. (RDR, Redirected Direct Rendering) Which is basically the core of DRI2. It also allows supporting memory related OpenGL features like VBOs or FBOs(Vertex/Frame Buffer Object) which brings the compliance level of MESA up to OpenGL 1.5. Theoretically everything up to OpenGL3 could be implemented now, but since of the old design of MESA everything would have to be implemented for each driver over and over again. That is why Gallium3D was created. It is a intermediate level API which abstracts from the hardware by just offering a state tracking interface. On top of that it is possible to implement more sophisticated APIs like OpenGL, OpenCL or a Video Decoding API like VDPAU. These implementations can then be shared across all drivers which are built on the Gallium3D architecture. Next Next post: Does anyone need Epiphany?